Ductless air conditioners are also known as mini-split air conditioners since they work in similar fashion to ducted central air conditioners, but on smaller scale. Ductless air conditioning systems have gained popularity in recent years for their ease of installation when compared to central air conditioning, and their quiet and effective operation in both homes and offices. 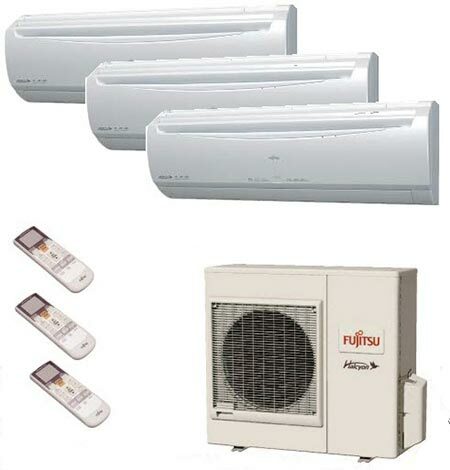 They also provide comfortable and efficient heat and are commonly referred to as ductless heat pumps. Ductless air conditioning systems don’t use ductwork or ducted air distribution like a central system. They are comprised of two basic components: an indoor unit and an outdoor unit. An indoor unit contains an air handling unit, an evaporator and a blower. An outdoor unit contains a condenser and a compressor. Ductless heating and cooling systems provide a number of advantages; there is no heating or cooling loss via the ductwork, the footprint of most units is quite small, and most indoor units operate via a convenient remote control. Using these hand held remotes you can heat or specific areas of your home or office, making them more efficient than central systems in many instances. Each year we get more calls to repair improperly installed ductless AC and heat pump units. Too many unqualified installers believe they simply have to flare a pipe and connect the wiring with no understanding of the working unit or the electronics such as the diode bridge, inverter power module, active filter module, or other components that are vital to superior operation. Here are just some of the countless quality measures Advanced Comfort Systems takes to ensure you enjoy top performance from your Fujitsu unit. We sell more Fujitsu units than anyone in the Hudson Valley and all of our service technicians are factory trained! Because there are no ducts, Halcyon systems lose less than 5% cooling vs. up to 40% for traditional forced-air systems. Heat or cool the areas you want, and not the areas that are unoccupied. Louder components like compressors and motors outdoors are installed outside providing a peacful environment inside. 1 to 8 indoor units, varying in size and style, connect to 1 outdoor unit to heat or cool individual rooms, hallways and open spaces.